වසර ගණනාවකට පෙර(වයස අවු 10ක් වන්නට ඇත), පළමු වර කියවීමේදී මගේ සිත් ගත්තේ චරිත හා පරිසරය විස්තර කර තිබුණු ආකාරය යි. (view spoiler)[ මාමා: "කැමති නම් උගන්න පං, බැරිනම් පුච්චාගෙන කාපන්" අති සරලව මාමාගේ චරිතය පෙන්වයි. (hide spoiler)]. සරල ව කිවහොත්, කුරකුරේඋව තුළ වසමින් කතාව රස විඳීමි.නමුත් මෙහි ඇති ගැඹුරු අරුත තේරුම් ගැනීමට හැකිවූයේ පසු කලෙක නැවත කියවූ පසු ය.තරු 5ක් දෙමි. පුළුවන් නම් 10ක් වුනත් දිමට නොපැකිලෙමි. චිංගීස් අයිත්මාතව්ගේ Duishen නවකතාව දැදිගම වී රුද්‍රිගු විසින් “ගුරු ගීතය” ලෙස ඉතාමත්ම සුන්දර ලෙස පරිවර්තනය කරලා තියෙනවා. මේ පොත බොහෝ කාලයක් තිස්සේ ගුරුවරුන් සහ ගෝළයන් විසින් එකසේ රසවිඳි පොතක්.රුසියන් විප්ලවයේ ආරම්භක කාලයේදී යුද හමුදාවේ යන්තම් අකුරු ලියන්නට හා කියවන්නට හැකිවූවන් පවා යොදා ගනිමින් අධ්‍යාපන විප්ලවයක් කළ අයුරු තමයි මේ පොතෙන් කියවෙන්නේ. සාර් වරුන් විසින් අනුකම්පා විරහිත ලෙස සූරා කෑ රුසියාව වගේ විශාල රටකට අධ්‍යාපනය ලබාදෙන එක සෝවියට් ආණ්ඩුවට කොතරම් අපහසු වුණාද යන්න මේ පොතෙන් මැනවින් පැහැදිලි වෙනවා.මේ පොත සෝවියට් ආණ්ඩුව විසින් හුදෙක් ප්‍රචාරත්මක කෘතියක් ලෙස දොරට වැඩුවත් ඒක අපේ රටේ බොහෝ දෙනාගෙ ආත්මය බවට පත්වී තිබෙන්නේ අපේ රටේ දුයිෂෙන් වැනි ගුරුවරුන් තවමත් ඉන්න නිසා වෙන්න ඇති. ඒ වගේම අල්තිනායි වැනි මුල අමතක කරන ශිෂ්‍යාවනුත් ඇති පදමට ඉන්නවා. ඒත් අල්තිනායි ගැන පොතේ අවසානය තෙක්ම ඇතිවන්නේ දුකක් මිස තරහක් නොවෙයි. මේක තමයි බොහෝ හොඳ ගුරුවරුන්ගේ ඉරණම. කාලෙත් එක්ක ඔක්කොටම අමතක වෙලා යනවා.අල්තිනායිගෙ සිතේ දුයිෂෙන් ගැනත්, දුයිෂෙන්ගේ සිතේ අල්තිනායි ගැනත් ගුරු ගෝල සබඳතාවට එහා ගියපු ප්‍රේමයක සේයාවක් සමහර තැන්වලදී පෙනුණත් ඒක මතුවෙන්න නොදී යටපත් කිරීමට රචකයා සමත්වෙලා තියෙනවා. I got a copy of Chingiz Aitmatov’s Duishen novel as an e-book through the Facebook Group පොත් කියවන අය. I read the 35-page e-book within a day. It was easier to read as I had already read its Sinhala translation, ගුරු ගීතය. Aitmatov’s Duishen is basically a soviet propaganda novel but it allures any reader irrespective of race or creed as its theme, the emotional bond of a hardworking teacher and a talented student is universal.Duishen, an ex-revolutionary, comes to his village after the revolution and the revolutionary Soviet government has entrusted him with the task of starting a new school without providing any facility except a meager salary for him. He explains the importance of educating the children in the village to their parents but fails to convince them. They are ignorant busy farmers and don’t understand the value of education as the only option they see to succeed in life is farming.Having been snubbed by the villagers for his request to help him build a school, he embarks on a solitary task of converting an abandoned stable into a school. His only admirer is a teenage girl called Altynai who helps him dropping cow dung as fuel in his stable in secret one day. It is from this girl’s perspective that the book has been written. She becomes an immediate beneficiary of the school as she is very smart in learning. But her guardian aunt and uncle (Altynai is an orphan) loath the school and only let her go to school after Duishen uses force with the revolutionary government’s documents.After becoming a great admirer of young teacher Duishen, Altynai almost falls in love with him but he treats her only as a loyal student. His only dream is to see Altynai succeed in education and become a big academic one day.In the meantime Altynai’s guardians sell her to a middle-aged rascal of a man who has daughters older than Altynai. He already has a wife and Altynai is raped by him in his hut while she was only 15. She becomes a concubine of this cad. Before being raped, Duishen fights this man and his helpers to save Altynai but he fails as he is overpowered by the group.I think I have told you more than enough. The rest rests in your hands now. Download or buy the book and read it for yourself.There is also a movie based on this book called The First teacher but it is extremely rare to find. قصة قصيرة بعاطفة بحجم السماء.. جندي عائد من الحرب الى قريته، يقرر ان يعلم صغارها على الرغم من سخرية الجميع..وبعد سنينتعود الدكتوره الجامعية التيناي الى مسقط راسها:ويمر خلال الاحتفال ذكر العجوز ديوجين الذي جاء على التو حاملا برقيات للقرية، فتنتفض الدكتورة ألتيناي و تسأل مضيفها ـ الراوي ـ: (عن أي ديوجين يتحدثون؟ـ انه ساعي البريد في الكولخوز يا ألتيناي سليمانوفا، أتعرفينه؟)بدأ القلق والتوتر يظهران على ألتيناي.. فتبدأ حكاية اخرى..
"Bazen insanın, sırtından da baksan yüreğinde olup bitenleri kavrayabilirsin. "...Aytmatov kendi eşsiz tarzını oluşturmuş çok yönlü bir yazar. Her hikayesi eşsiz bir tablo gibi. Baktıkça bakasın, okudukça okuyasın geliyor.Hikayelerinin zenginliği ise bence, yoruma açık olmalarından kaynaklanıyor.Aşk, sevgi, bağlılık ve tabiat sevgisi o kadar canlı tasvir ediliyor ki, hayran kalmamak mümkün değil.Bu hikayesi çok kısaydı ama çok güzeldi . Değişik duyguları iç içe yaşattı. Cengiz Aytmatov, bu uzun hikayesinde Altınay ve onun ilk öğretmeni olan Duyşen'in yaşadıklarını işlemiş.Cehalet içindeki bir köyde, bir öğretmenin çocuklara eğitim vermesi ve ülkenin kalkınması için çabalaması eserin konusu.Cengiz Aytmatov'un her eserinde hisssettiğim gibi, o sıcacık anlatımı yine bana okurken çok zevk verdi. 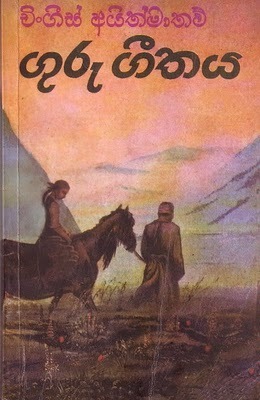 Chingiz Aitmatov's Duishen is a famous read in Sri Lanka. It's translated to both Sinhalese and Tamil. Couple of months ago, I saw the English translation and decided to buy it. The novel is narrated by an artist who is given the responsibility to convey a touching story of an orphan who for the first time ever is treated with love and respect by the teacher. The story revolves around this illiterate teacher(Duishen), his student (Altynai) and the two poplar trees standing tall like forming a link between the past and the present.Each nation offers one single book on educators/education which will make you weep, this is the ONE from Kyrgyzstan. මේ ප්‍රබන්ධය එතුල ම විස්තර වන හිම කුණාටුවක් වැන්න. වරෙක එය වේගයෙන් හමයි. තවත් වරෙක නැවතී, ඉතා සෙමෙන් ඉතා කුඩා, හද බඳින මිටියාවතක සුවය විඳිමින් ඒ පසුකොට යයි. එහෙත් අවසානයේ වසන්තය පැමිණෙයි.ජීවිතය ද ගලනා හැටි කථාකරු අපූරුවට ඉදිරිපත් කරයි. වෙනත් පොත්වල මෙන් මෙහි අතහැර කියවන්නට අකුරුකුදු නැත. හැම වචනයක් පාසා ම එහි ඇත්තේ කථාවට පණ පොවන, රස වඩවන උපමාලංකාරයෙන් ව්‍යංගව ජීවිතයේ හැටි පහදා දීම ය. "උල්පතක්" සබැඳි අවසන් කොටසේ එන ඡේදය ඍජුව පූර්වාපර සන්ධි ගලපාගන්නට උපකාර වන්නකි.අල්තීනායි මෙන් ම අප ද තවමත් සොයන්නෝ ය. The power of a little guy. Good regular people doing their regular jobs well out of the spotlight, with no expectation of acknowledgment. Play your little part and move on without much noise. Beneath the politics and the propaganda, there lies a story which could be found relevant even today.In places with war , poverty and discrimination , any child would be glad to have a "Duishen" who would bestow upon them the gift of Education against all odds. While reading , I thought about the girls in Afghanistan and Nigeria who are finding dire obstacles, in their quest for knowledge.I spared a thought to the child brides in Yemen, who will not be rescued and sent to school. For each one of them , I wished for more modern day Duishens.Duishen in the Novella is an Idealistic young man , a freshly minted Socialist Party comrade, an Ardent follower of Lenin and an Inspiring "First Teacher". Unfortunately , we will not know his side of the story. At least I'm glad that Altynai was kind enough to share her recollections of her adolescence and first love. "Yes, there will be winter, there will be cold, there will be snowstorms, but then there will be spring again... "
Thr painter in The story is someone who's sensing buds which were irrigated by blood of unfinished Love. The main character represents determination and passion.His respect for Vladimir Lenin urged me to read about him. His passion for his leader is enviable.I had read it in Urdu translation in old world literature magazine called "Sabrang(All Colours) Digest" in my adolescent years. This is why here's no desire to read it again as this will ruins the impact it had left on that innocent mind.So in short a life changing story. Certainly it made a bitter, patriot, aggressive Pakistani communist. http://ucalisan.blogspot.com.tr/2014/...Savaş sonrası Süleymanova köyüne öğretmen olarak görevlendirilen Duyuşen ile öğrencisi Altınay'ın köyün girişine diktiği kavakların anlatıldığı Aytmatov'un harika bir hikayesi daha. Sadece 61 sayfaya sığdırılmış olmasına rağmen anlatım güzelliği ile yine büyülüyor. I do not agree with the political philosophy of the book, but the brushstrokes of humanity that it uses to paint the picture in your mind is nothing short of phenomenal. I love how this story of just 35 pages (read the English translated version off a downloaded PDF), has made a lasting impression on my mind. Importance of a sound education (regardless of gender and social status) and how much a little encouragement can go a long way cannot be emphasized on more! Vivid imagery through poetic phrases and the use of symbolism. A good read indeed. A beautiful novella on life in a remote village in Kazakhstan in the early days of the USSR, when the future looked bright. The best book I have ever read.